Call of War is an exciting real time strategy MMO during the early days of WW2, in the game players join a new world map and take over one of the available world leaders and controlling an entire country. Responsible for gathering needed resources to raise an army and defend your lands, or turn your sites on your rivals and conquer their territory, it is up to you if you wish to re-write history and determine who will be friend or foe using combat, trade, diplomacy and espionage against other players. The game is completely free to play and can be accessed with any web browser and doesn’t require a client download to play. Each leader has a selection of provinces to rule over based upon their randomly assigned country from Europe or North America, the aim of the game is to spread your border and take control over other provinces controlled by rival players to gain influence, resources and, more importantly, Victory Points. Certain key provinces give the player that controls it a number of Victory Points, it is with these points that players can ultimately win the game, at which point the world/round will reset for players to start against in a new world. 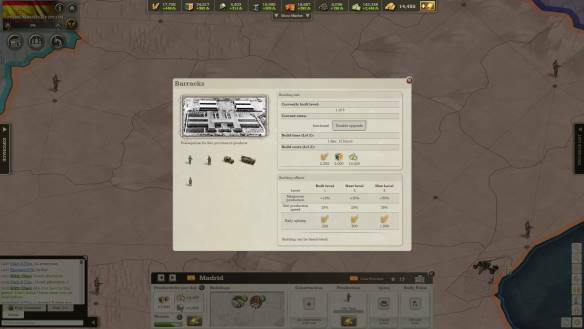 Within each province players must upgrade their key military buildings in order to produce powerful military units, only accessible after they have been unlocked through the Research trees; there are multiple trees that a player can progress down to unlock new military units, Infantry, Naval, Armor and Air as well as unique “Secret” units that are great for added power and utility. Researching new technologies takes time, but players are also restricted by needing pre-requisite techs and also by what day in the Round that they can begin researching i.e. from Day 4 and onwards once the round has begun players can research Infantry Level 2, which is a pre-requisite technology needed to progress into Motorized Infantry Level 1, but this new technology can only be researched from Day 12. Research, building upgrades and military units all take time to construct as well as a portion of the players key resources: Food, Goods, Manpower, Metal, Oil, Rare Metals and Money, whether to initially produce it or as ongoing maintenance/upkeep to ensure the unit keeps running. With units players are able to maneuver them around the map, either through their own territory or into a rivals; if no open borders have been granted from that rival player then this is seen as an aggressive act and a prelude to war. Wars, battles and other key events are documented in each individual world Newspaper, a new issue released daily with updates of what is happening between the various nations, who is at war, who have made alliance and anything else of importance. Players have the ability to even write articles to publish in the newspaper for other players to see as a way to entice, bait or generally communicate with them.